QuickBooks accounting is the solution to many problems a business can encounter. Our ProAdvisors will assist in the set-up and training of its use, as well as on-going consulting and support for your needs as your business grows. Proper installation of Quickbooks will prevent future headaches and provide the utmost accurate information on your finances. We will assess your business needs with you to find the best methods within QuickBooks and which Edition will best serve your business. 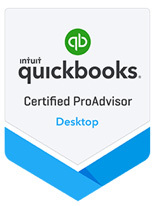 As Certified QuickBooks ProAdvisors for Online, Desktop and Enterprise Editions, we can help you select which edition is best for your business model and train your staff on its use to meet your business goals. With our expertise, we will get your business up and running with QuickBooks so you can focus on growing your business. We care about taking care of your business needs. As your business grows, our ProAdvisors will provide insight on what features or changes need to be made to your QuickBooks. We provide any QuickBooks support you will need in Spokane & Coeur D’ Alene area on-site. If you run into a problem, contact us and we will be in touch as soon as possible to assist you in solving the issue.